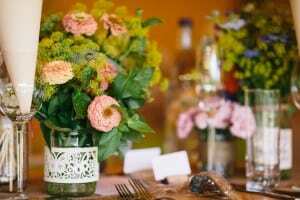 Inspired by a meadow-picked theme for your wedding? 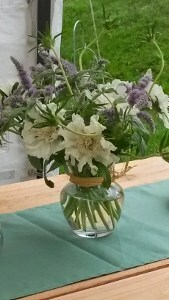 Ask your florist to help you choose key areas, flowers and containers to create this country look. 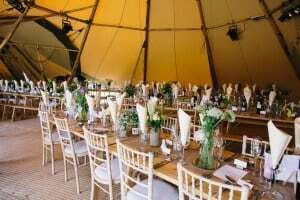 Meadow picked flowers add a really natural and informal style to your wedding. 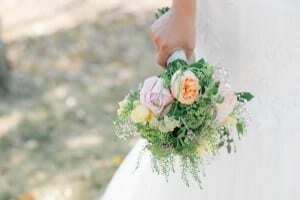 The flowers can begin with the bride and bridesmaids bouquets and be at juxtaposition with the most glamorous of dresses or compliment a more bo-ho look if preferred. Then of course rollout the meadow picked look to the venue decorations too. A special romance is always added when the aisle walkway can be decorated. 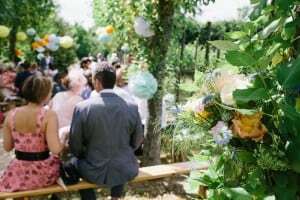 If you are lucky enough to get married outside use existing features like trees, fences or gates to adorn. 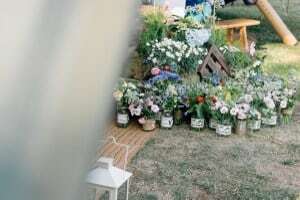 Adding lace, raffia or string to secure your flowers, all add to your meadow picked look. 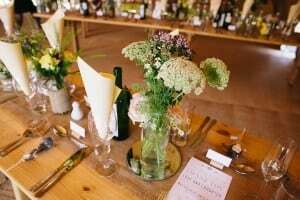 Co-ordinate the top table and the guest tables to continue with your meadow picked theme. 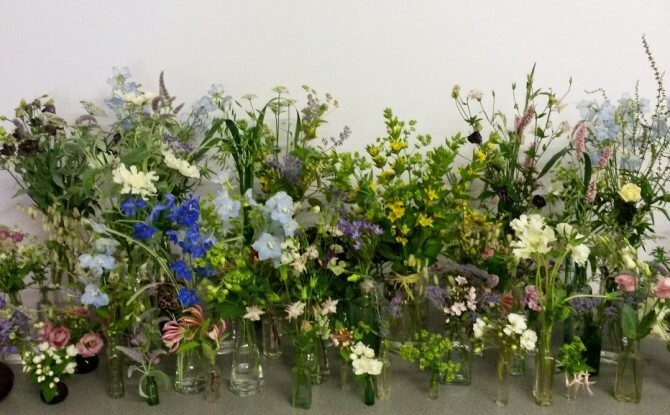 Decorated jam-jars, old medicine bottles, coloured glasses, scent bottles, and vintage jugs all make a great base for meadow picked table flowers. 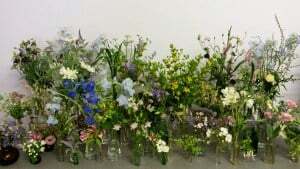 Ask your florist or stylist to use them in little groups. A stand-alone jar or bottle can be a little lost in a large scale room. Table runners are a great base to add gravity to jars and bottles. Neutrals or blues and greens are good base colours that won’t overwhelm simple bottles or delicate vessels. 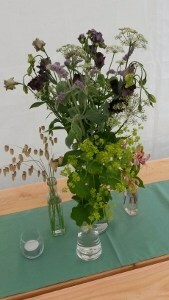 Consider texture as well to enhance the meadow picked feel by using hessian or lace. Mother nature is a great source of inspiration for your just from the meadow picked look. 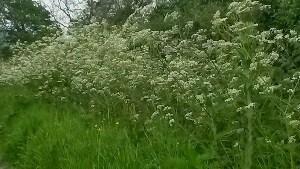 Think hedgerows and wildflower gardens to stimulate an informal approach to your wedding flowers. 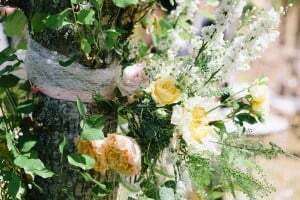 The flowers used to create this look are often quite tender and especially need to be conditioned before arranging and your florist will understand this. 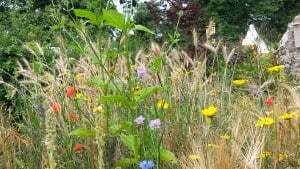 Then they can create informal meadow picked splendour in wooden crates, apothecary jars, old fashioned milk bottles or a humble tin can. 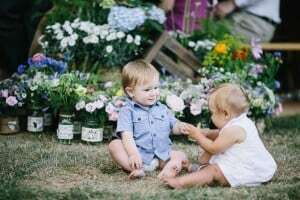 Even the youngest of your wedding guests will love the understated beauty of meadow picked wedding flowers!